The demand for faster time to market, design optimization, and cost reduction is driving the rapid adoption of workstation products in many industries. Not long ago, workstations were relegated to high-end design tasks such as complex mechanical assemblies, buildings, and aerospace design. Today, workstations are used in every major industry for tasks ranging from financial modeling, to designing ...complex buildings and vehicles. Workstations have become standard equipment for engineers, content creators, analysts, and others who need the highest levels of performance, visualization, and data integrity. Increasingly, design professionals and engineers are using Intel® Xeon® processor-based workstations to create, test, and modify new ideas almost as fast as they can think of them. 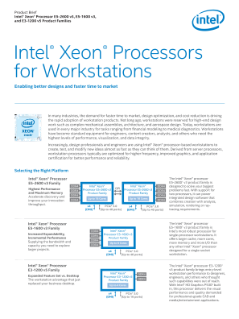 Derived from server processors, the workstation processors are typically optimized for workstations through higher frequency, better graphics performance, and application certification for better performance and reliability.